It’s been a while since I’ve discussed a specific company; that changes today with my thoughts on FNV.TO – Franco-Nevada Corp. Franco-Nevada Corp. was one of the first companies I invested in, many years ago, and I believe I made a few bucks on it. Pierre Lassonde and Seymour Schulich co-founded Franco-Nevada Mining Corporation in 1982, and, according to the Lassonde Institute for Mining website, provided shareholders with a 36% annualized rate of return over a 20 year period. That’s a pretty good rate of return, but there were some ups and downs, and shifts in direction, along the way. Franco-Nevada began as a gold exploration company, and since in my internet searches I can find no evidence of the company “striking it rich”, I assume they never did find the “big one”. You have an oilfield, or a gas deposit, or gold deposit, and you need a bunch of money to develop it. Bank financing is prohibitively expensive, but you don’t want to issue shares to dilute the ownership of the company. Instead, you issue a royalty stream to investors. You need $1 million; I’ve got a $1 million. I agree to give you the $1 million, and in exchange you agree to give me 10% of all oil produced from your well, or gold from your mine, forever. You still own 100% of your mine. You control it. You manage it. All I get is a share of the profits. From my point of view as an investor, I write a cheque (or a check if you are in the U.S.), and that’s it. I don’t have to worry about management, or production, or regulatory problems, or unions, or anything. In fact, all I need to do is due diligence. If I purchase royalty streams in solidly managed companies, with good resources, I do well with no further work. And that’s what Franco-Nevada did. While still ostensibly a gold exploration company, they blew half the money in the bank, $2 million, on a 4% royalty interest in Western State Minerals. It turned out to be a sweet deal, and by 2003 that one investment was generating $23 million annually for Franco-Nevada. By the late 1990’s Franco-Nevada only owned one mine, Midas, in Nevada. In April 2002, Franco sold Midas to Normandy Mining for 20% of that company’s shares and a 5% royalty on the mine. That’s where the fun began, when AngloGold of South Africa offered to pay a nice premium to buy Normandy (which of course was 20% owned by Franco), to give Franco a 60% gain on investment. But, as I said earlier, Pierre and Seymour were no dummies, so they figured they would start a bidding war by contacting Newmont Mining and saying to them, “hey guys, why don’t you buy all of Franco-Nevada”. And they did. And Lassonde became the president of Newmont, and Seymour became a director. 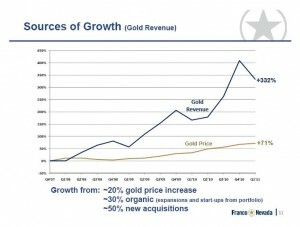 In 2002 Newmont decided to spin out all of it’s royalty interests (to concentrate on mining), so a new company, Franco-Nevada Corp. was formed (not to be confused with the old Franco-Nevada Mining Corp.), doing a $1.1 billion IPO, which, at the time, was the biggest mining company IPO in North American history. After the IPO, Pierre Lassonde became the Chairman of the new Franco-Nevada. 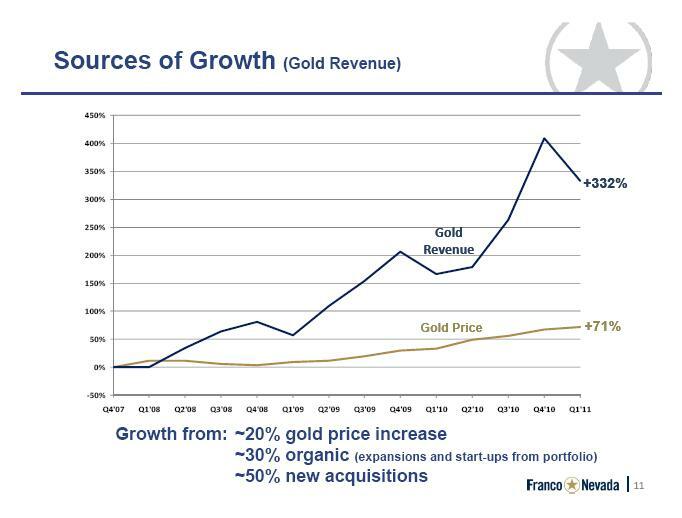 1 Franco-Nevada is projecting growth of 60% this year (which isn’t surprising given what the price of gold is doing). 2 As discussed above, the royalty stream model is low risk. 3 Risk is further reduced through project diversification. They have well over a 300 different projects in their portfolio, so if a few of them “go south” it won’t matter. Diversification exists geographically (less than half of their projects are in the U.S.), and by commodity type (74% is gold), and by project (no single asset represents more than 15% of NAV). (You can see the chart, and read the entire management presentation, by downloading this pdf document from their website). All management presentations are also available. 5 Franco-Nevada pays a monthly dividend of 4 cents U.S. per share, which at current prices is an annual yield of just over 1%. Okay, that’s not much of a reason to buy a stock (who cares about dividends these days? ), but at least it’s something. The dividend has increased in each of the last four years. (Of course if I was an institutional investor, and if I grasped that fact that Franco has one of the highest yields in the gold sector, I might be very tempted to jump on board). That’s all well and go, but why buy now? First, are you asleep? Have you not noticed the price of gold making new highs? Second, there should be company specific good news in the next two months. For example, the Tasiast Mine in Mauritania should start sending royalty payments soon, with increases in resource estimates possible. 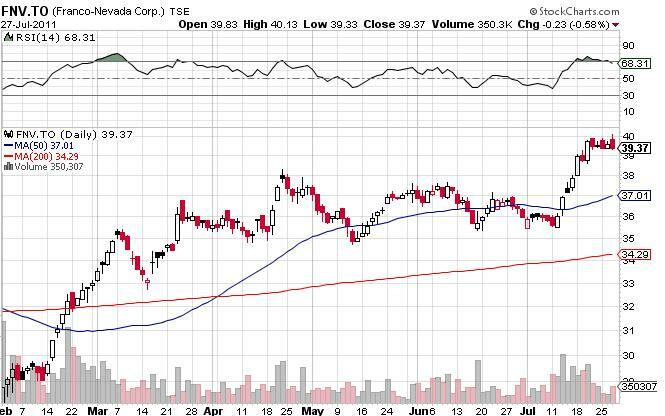 (And yes, the Tasiast Mine is owned by K.TO – Kinross Gold Corp. which is probably a good buy at it’s current price, but that’s another story for another day). Another possible win for the company is the drilling program happening at the Detour Mine in Northern Ontario. Their processing facility is viable if gold is over $1,000 per ounce, so I don’t see viability being a problem. Do I own any Franco-Nevada? (I’m not one of those newsletter guys who buys up a bunch of shares, and then writes a post to get everyone to buy. Of course with my three readers, I doubt I can influence the price anyway……..). “Not yet” means I will be buying, and soon. In fact, I will interpret all market weakness as a buying opportunity. I will buy the shares, and if we have a steep correction I may also buy some warrants (FNV.WT on the TSX for warrants exercisable at $32 per share, expiring March 13, 2012, which are really just a medium term option). Fasten your seat belts, and let’s see what happens.